A soothing and nourishing soup, old cucumber soup helps to cool the body and aids in detoxification. 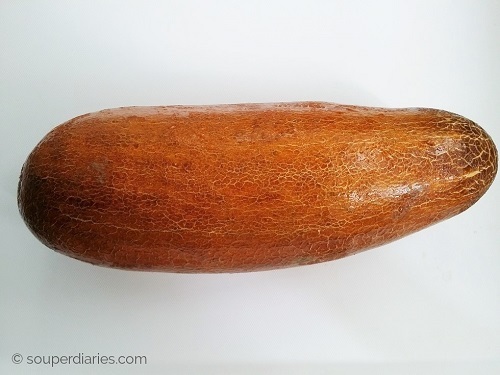 Old cucumbers are mild tasting on its own. 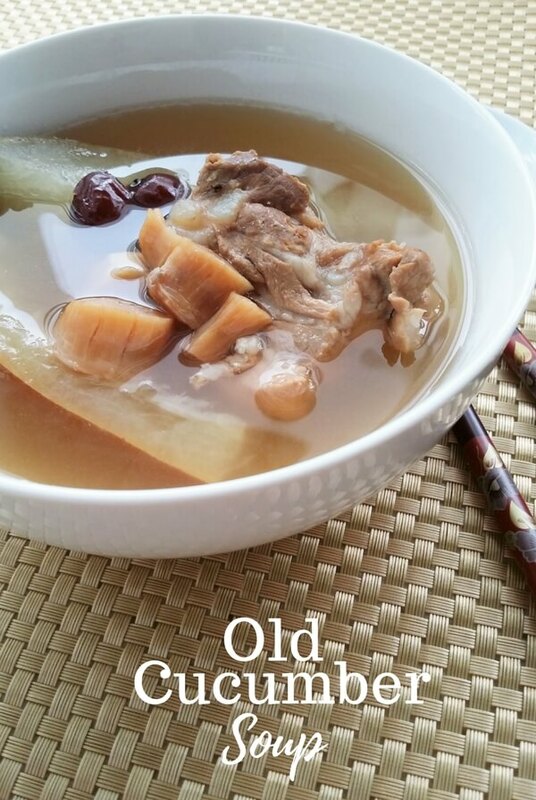 The addition of sweet corn, dried cuttlefish, dried scallops, honeyed dates and dried red dates creates a naturally sweet tasting and rich flavored soup. Recently, the haze returned to Singapore prompting me to boil soups almost everyday to boost my body’s immune system and to dispel heat and toxins. We have to take care of our health, right? I came across some old cucumbers (which are actually matured cucumbers) in a market and decided to cook some old cucumber soup (also known as lao huang gua tang). In Chinese culture, it is believed that a balance of yin and yang in our bodies will promote better health. Yin-Yang is a concept of how opposing forces are actually complementary to each other in creating balance. In general, food that will cool a person down like cucumbers, daikon and watercress are considered yin food while yang foods are warming like meat, ginger, nuts and eggs. Followers of this philosophy will eat yin (cooling) food when it is hot and yang (warming) food when it is cold. 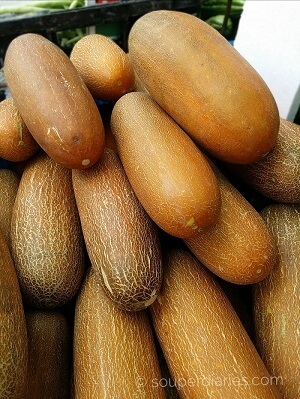 Despite its crinkly and rough appearance and texture, old cucumbers are regularly used in Cantonese soups as it is known to be a cooling ingredient and aids in eliminating body heat. Not only that, it is also believed to be anti-aging and is good for the skin. It is also high in dietary fiber and very low in calories. This soup is a must to drink every now and then in hot and humid Singapore or whenever you’re feeling all summery inside. Another cooling soup that I like is this Watercress with Pork Ribs Soup. When preparing the old cucumber for this soup, it is not necessary to remove the skin. Otherwise the flesh will disintegrate easily into the soup. The skin holds the flesh inside together. As the skin is not peeled off, gently clean the old cucumber before cutting and cooking for hygiene reasons. Usually, I don’t boil this soup with sweet corn but I happened to have one in my fridge so I threw that into the pot as well. The result was a naturally sweet soup which I hope you’ll like too. 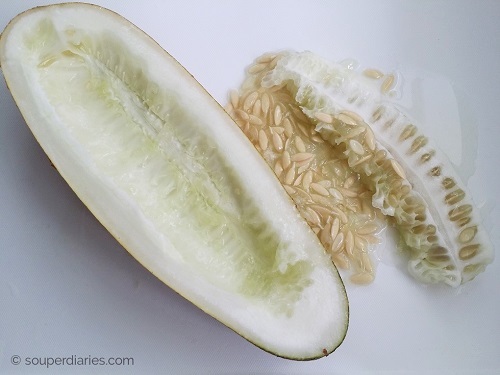 Cut old cucumber into half and use a spoon to scoop out the seeds. Then cut it into large chunks or whichever way you would like to eat it. This soup is not only very easy to put together but it is healthy, nutritious and tasty as well. If you have a thermal cooker, you can cook and keep it warm in the cooker for a few hours and it will taste even better. As always, when it comes to cooking Chinese soups, use the freshest ingredients possible to get the best tasting soup. Eat well, be well and happy cooking! Need more delicious ideas for soups? Check out my Slow Simmer Soups and Quick Soup Recipes! A nutritious anti-aging and nutritious "old fire soup". Parboil the pork ribs in a small pot of boiling water for a few minutes to remove impurities. Turn off heat, rinse and set aside. Transfer the clean pork ribs into your soup pot. Place the rest of the ingredients into the soup pot. Pour in just enough water to cover the ingredients and bring to a boil. Once it has boiled, reduce heat and simmer for about 1.5 hours - 2 hours until the meat is tender. Season with salt to taste. I won’t come here hungry again, lol! What an interesting combination of ingredients for a soup. It’s amazing how many different cultures use foods in so many varied ways. I never would have thought to use old cucumbers in soup until I saw this recipe. However it sounds like an old favourite in your part of the world. I may just have to try it next time.